Enjoy making homemade pumpkin puree by baking your own pumpkins. 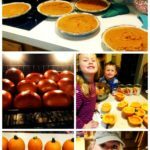 Then whip up this wonderful homemade pumpkin pie recipe! Don’t forget that you can also make ahead and freeze your pumpkin pies if needed. This recipe make 4 pies. Mix all listed ingredients together well in large mixing bowl.